The EA utilizes 3 levels grid to capture any direction be it bullish up or bearish down, either way, the EA will end in profit. The EA is called fury as it cuts a very tight loss and immediately compensates the loss into new lot size calculation on the remaining positions. If the initial lot size of level 1 is 0.2 and the EA cuts it at loss at 10 pips, the next lot size will be 0.24 lot (depending on multiplier setting). There will be 3 Buy Stop orders above mid-level, and 3 Sell Stop orders below mid-level. If Buy Stop Level 2 is filled, the 3 Sell Stop Orders below will be re-positioned higher at 2 levels behind the highest Buy Order that has been filled. As consequence, the Sell Grid and Buy Grid will tighten, maximizing the probability the EA hitting its profit target. 1. Trendline Above: a trend line is drawn above to be placed at critical levels such as Resistance, pivots, or swing highs. 2. Trendline Below: a trend line is drawn below to be placed at critical levels such as Support, pivots, or swing lows. 3. 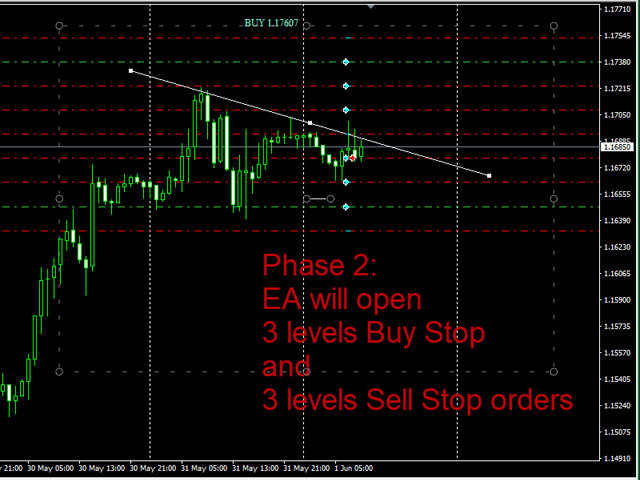 Auto: for immediate trading, that continually runs until the user manually exits the EA. The only weakness for The EA is when the market in a tight range for a very long period. Please do consult me for optimal settings. The default is set for minimum profit, and very low risk. - Fixes lot calculation on 2 digits and 4 digits broker. 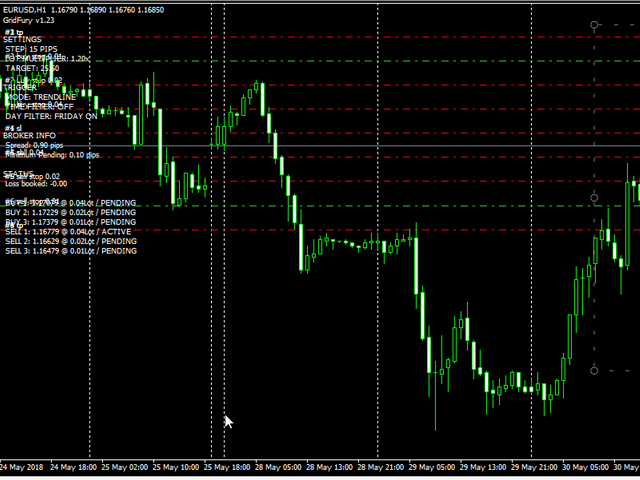 - Add 2 Lot Modes; Percentage from Equity and Dollar, along with lot proportion setting for either of these mode. v1.25 merged AUTO mode into trigger_mode selection. This version also introduces a new AUTO TRIGGER: MEAN REVERSAL. The principle behind mean reversal is that the EA monitors signal from price that moves too far from the MA line at predefined pips. v1.24 EA Detects price gap or movement beyond the grid's range and immediately applies cycle reset.